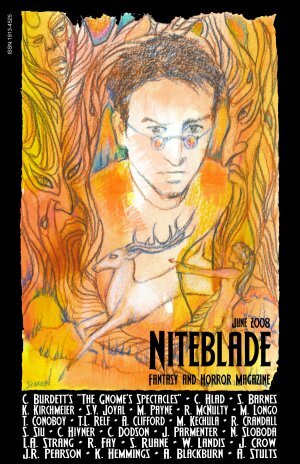 The newest issue of Niteblade is out. Issue #4: The Gnome’s Spectacles is going live right now…early. How’s that for a bit of awesomeness? And when it comes to awesomeness, let me tell you, this issue is chock-full of it. I think the poetry is especially strong in this issue. In addition to the killer poem that was granted the cover this period there are pieces about the Wicked Witch of the West, death, space, aliens and an amazing prose poem. I know, I’ve really had issues with prose poetry in this past, so the fact I found one so good I agreed to publish it has to say something good about the piece, doesn’t it? The poems run the spectrum from funny to depressing and touch in on a load of other adjectives too. Really, this issue is definitely one worth checking out — and perhaps best of all, it’s free.